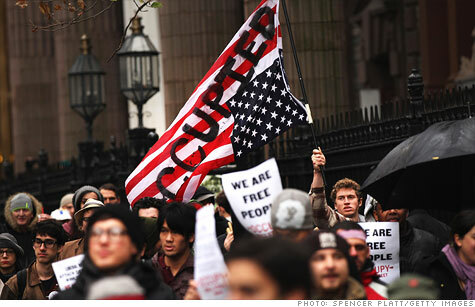 Occupy Wall Street may not have tents anymore in Zuccotti Park, but they have plenty of money. NEW YORK (CNNMoney) -- Just days after Occupy Wall Street's two month anniversary, Zuccotti Park sits nearly empty -- but the same can't be said about the movement's bank account. Fundraising for the protest movement -- particularly online -- has been an incredible success, according to OWS finance group member Pete Dutro. The group has collected almost $600,000 in tax-deductible donations since it began accepting them in late September, Dutro said. Of that, it still holds $455,000 in its bank account, he said. "Because we are sort of the figurehead occupation, we get a ton of donations," explained Tyler Combelic, a member of the protest's media team. "Much more than any of the other singular occupations." In the past, these funds financed the tent city that emerged at Zuccotti Park, covering the cost of such things as food, medical supplies, camping equipment, sanitation, and even bail bonds, when the occasion called for it -- hundreds of protesters have been arrested in New York alone in the last two months. Last week as the two-month anniversary of OWS approached, Mayor Bloomberg had the protesters removed -- along with their impromptu city -- and new rules were put in place prohibiting camping. While the decision made it clear that Occupy Wall Street would no longer have the presence or support of a formal encampment, it also meant that the organization's large bankroll would no longer bear the burden of supporting the daily finances of hundreds of protesters. "At least from the teams that I've been a part of, there's been a lot of discussion about what to do next in terms of finance," Combelic said of the new situation. In the coming days members of the finance committee say they will initiate a process to streamline the movement and re-evaluate their budget. They may eliminate or restructure some of the "working groups" they no longer need on a day-to-day basis. "We have some ideas but we want to hear ideas from the other working groups," said Dutro, "So we can put forward a proposal that would be fair and suit everybody's needs." In the meantime, the movement will continue to organize out of donated office space and give money to other "occupations." Combelic said his group gave money to Occupy Oakland and Occupy Harlem last week. Harlem got $3,000 but he didn't disclose how much was given to Oakland.